I know today is February 15, but I never had a chance to share this fun and easy science experiment-style craft Jacob and I did. Dissolve 1/3 cup or more of borax in hot water in a wide-mouth Mason jar or bowl. Submerge a shape made of pipe cleaners. It can be any shape, but make sure it will make it out of the jar without scraping the beautiful crystals off. Let it sit overnight or until totally cool and sparkly! 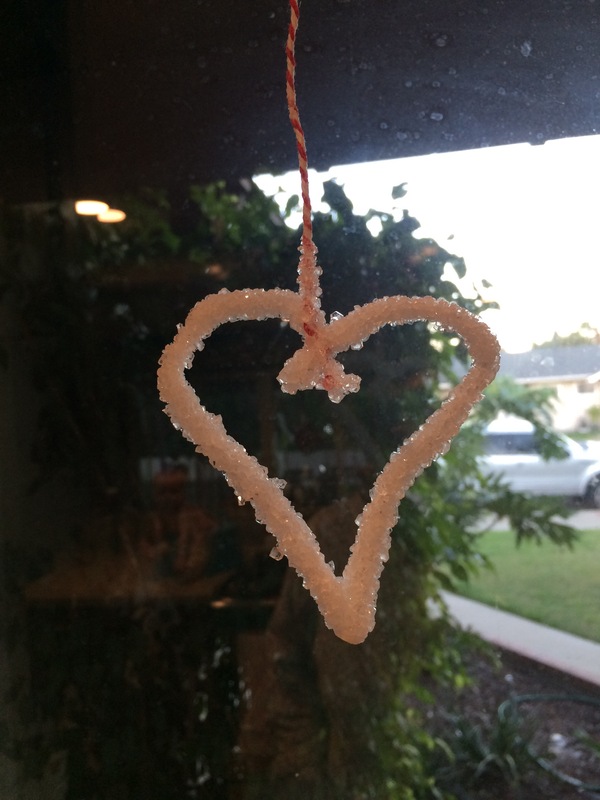 This entry was posted in Crafting for kids and tagged borax, craft, crystal, DIY, do, easy, grow, heart, kids, make, pipe cleaner, science, sparkle, sun catcher, Valentine's Day. Bookmark the permalink.